Mattel's Angry Birds games, Knock On Wood and On Thin Ice, have been hot-selling games in the marketplace, and there's a brand new game based on the Angry Birds Space app. The object of the Angry Birds Space Game is to be the first person to reach 1,000 points. To score points, players must knock over pigs and break open the pig's helmet or asteroid for bonus points. The game comes with Space Mission Cards that tell players how to set up the scene. There are four levels of cards. Level 1 is easy, Level 2 is harder, and Level 3 is the most difficult. The points values go up as the difficulty level does: 100, 200, 300. Level 4 is freestyle, meaning the Mission Cards will show you all the pieces you must use, but you can put them together however you want. The point values for Level 4 differ. Players take turns choosing Space Mission Cards. Once you've chosen a card, hand it to the next player. That player is going to build what's on the card and you're going to shoot it down. Place the launcher at least one foot away from the front of the structure. Then use the birds listed on the Space Mission Card (in the order shown) to shoot down the structure. Place the bird into the launcher, hold the launcher down with one hand, and pull down on the slingshot with the other hand. Let the slingshot go to send the bird flying. All of the pigs must be knocked over in order to score points. Keep the Space Mission Card to keep track of your score if you knocked down all the pigs. If you're not successful, move the Space Mission Card to a discard pile. Score 100 bonus points for cracking open the space helmet and asteroid. 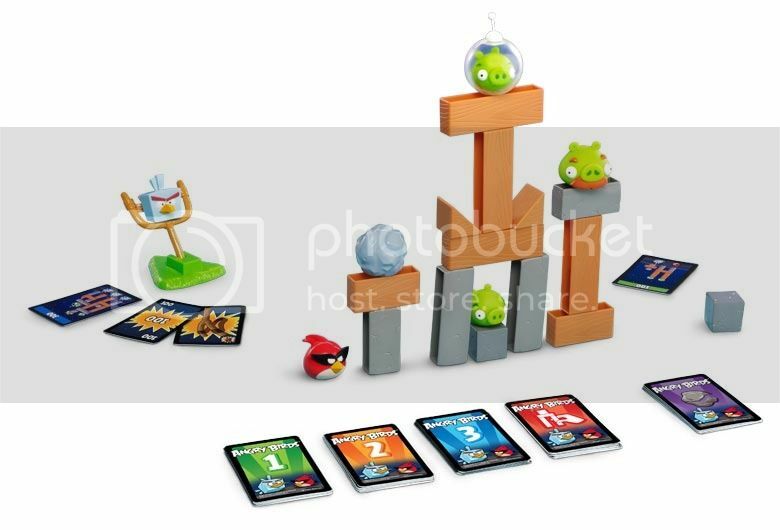 The Angry Birds Space Game comes with two birds (Ice Bird, Super Red Bird), a breakable asteroid, three pigs, a space helmet, a bird launcher, four large girders, two small girders, two triangles, two large stone girders, two small stone girders, two stone cubes, 32 mission cards, and eight points cards. The game is for two to four players. Angry Birds Space Game has elements that are derived from the app, but it interprets the app in a way that works as a real world skill-and-action game. It adds a social, interactive dimension to the electronic game. The competition and the build-it-knock-it-down action is perfectly positioned for younger kids. Just like the smartphone app, there is a slight learning curve to this game. It's a little tough at first to launch the birds, so it may take some time and patience to become an expert bird launcher. However, it largely uses motor skills and force so, unlike the app, which requires some level of strategic thinking and (however minimal) understanding of physics, this is a game that kids in the target age group can feel successful playing. Angry Birds Space Game is for ages 5 and up. The two pieces of the space helmet go around the pig and snap together. The breakable asteroid pieces also snap together.